Paul Thomas Anderson directed a film called “There Will Be Blood”. It is a cinematic masterclass, a film that continues to grow stronger amongst the heavyweights of film history because of Mr. Anderson’s attention to detail and the rigorous composition of a character named Daniel Plainview. Portraying this murky, dense character in the film is one of the greatest thespians to put performance to celluloid. Daniel Day-Lewis, a three-time Academy Award winner, is an actor who completely, obsessively embodies the characters he portrays. Mr. Day-Lewis played the 16th President with subtle, quiet attention in “Lincoln”, the resilient Christy Brown in “My Left Foot”, and a patriotic, murderous butcher named Bill in “Gangs of New York”; the actor can do just about anything in a performance. Director Paul Thomas Anderson and actor Daniel Day-Lewis are similar in that they strive for a unique, personal purpose in film and rally for perfection in everything they do. 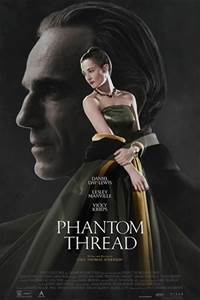 “Phantom Thread”, the second film together for these two cinematic titans, is a complicated love story, one that harbors themes of dominating control, deep and dangerous emotional connections, and a passion that is not easily defined. Reynold Woodcock (Daniel Day-Lewis) is a dress designer in London during the 1950’s. Working with royalty and the upper echelon, the designer passionately crafts masterpieces with needle and fabric; his stern and particular personality assists in the meticulous creations, each of which have a secret message sewn into the seams by the artist. Reynold’s meets a waitress named Alma (Vicky Krieps) while on vacation, the two begin a personal and professional relationship, one that challenges Alma’s independence and ideals about love while disrupting Reynold’s obsessive and tormented world. “Phantom Thread” is a beautiful film, filled to the edges with meticulous detail. The gorgeous costume design is the most obvious elegance, each dress fashioned as a nod to the character’s, and most likely the filmmaker’s, sensibilities. The score, composed by Johnny Greenwood from the band Radiohead, is exceptional; a blend of melodic harmonies that sway throughout the shifting tones of the film. The composition of the characters here is intriguing and at times arresting. Mr. Anderson utilizes three characters to dictate the subtle and drastic changes in tone throughout the film. Whether the modeling of a new dress design, a stroll along a blustery beach, or the preparation of dinner, the director controls these scenes and guides the audience in ways most filmmakers would struggle to maintain. The film has an inherent sense of humor, one that is manipulated in numerous amusing ways through an offhanded comment or a sly remark. It walks the thin runway of comedy, drama, and melodrama, though it is dependent on the viewer to make that determination, that’s the fun of it all. Daniel Day-Lewis is again impressive, from start to finish, in moments that are spoken and unspoken, Mr. Day-Lewis is intoxicating to watch. How does one challenge this powerful performance? You cast Vicky Krieps as the equal counterpart. Ms. Krieps, a relative newcomer, steals the show many times throughout the film. Her performance is pure confidence. Anderson paints an image here that will linger long after it is over, not because of anything offensive or obscene but because of the startling and subtle emotion portrayed by Daniel Day-Lewis and Vicky Krieps. Paul Thomas Anderson doesn't need a big canvas to paint his portraits, even with a film that has three primary characters with most of the scenes taking place inside closed doors, the final product is still a work of art. This is supposedly Mr. Day-Lewis’ last film, if so, he ends on a fine note. “Phantom Thread” is a strange love story unlike many you’ll see in the multiplex, it’s a tale of complicated lust and love, a psychological battle of wits between two passionate people, and a comedy about evolving relationships. Relationships are complicated and romance is unique and subjective; “Phantom Thread” never hides those qualities in the seams.